Experience the Benefits of Linking a Learner Account to your Administrator Account. As an Axis LMS administrator, you were always able to create an environment for your users, but now, you’re able to link an existing user account to your administrator login; this provides you a lot of new tools, that are otherwise exclusive to users. After linking your LMS admin account to a user account, your administrator interface will immediately update to reflect the change. New toolbars will become available, allowing you to quickly access Live Chat, and your UserConnect Profile. These icons are present on every page, alongside your Helpdesk tools. You will also be able to open these from the new Communicate tab. Once you are linked with a user account, you are also able to quickly one-click test your online courses. 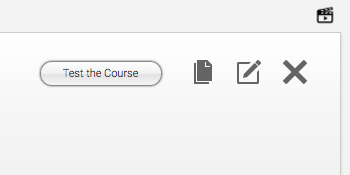 While managing any course, click the Test This Course button to automatically enroll and launch the course as your linked user. While the course is open, you can also backtrack to your Learning Portal to test out your changes in real time. To link your administrator account to a user account, start by creating a User in your Axis LMS. This user should be a user that is not actively participating in training, as some of the functions for testing courses will add/remove score and tracking data for the linked user. Once your User is created, go in your System tab, and then click the Partition Account tile, and then click the Settings icon to link your user. NOTE: Make sure you click the “I’m Done Testing button once you are finished testing to remove the score and tracking data for your linked user. After linking your admin account to a user account, your administrator interface will immediately update to reflect the change. 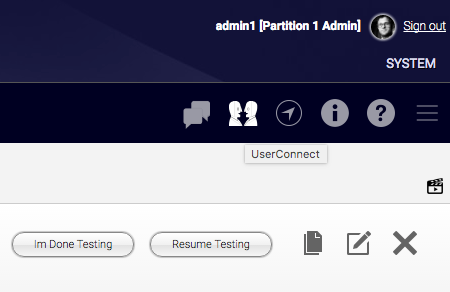 New toolbar icons will become available, allowing you to quickly access Live Chat, and your UserConnect Profile. These icons are present on every page, alongside your Helpdesk tools. 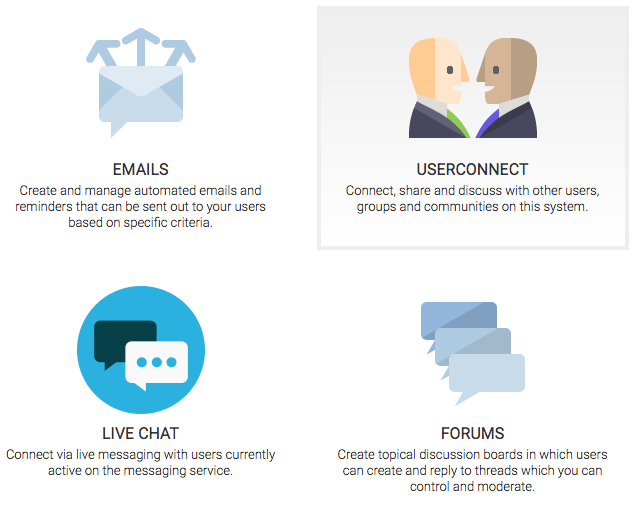 Live Chat, and your UserConnect Profile are also accessible on the Communicate tab. The linked user will be linked to the Partition Admin only. For sub-admins, linking a user is achieved by assigning a username to their sub-admin login that matches a username for a user account. This entry was posted on Thursday, April 13th, 2017 at 10:20 am	and is filed under ELearning 101. Responses are currently closed, but you can trackback from your own site.